It is July and time to hide the chicks! That’s right; while human parents show off their progeny — perhaps partly to solicit help in caring for them — loons do the opposite. You see, intruders looking to evict territorial residents scour lakes for chicks, because the presence of chicks indicates that the lake contains good nesting habitat and abundant food. So by producing young, a breeding pair has put a giant target on their backs, providing an incentive for any intruder that discovers the chicks (like one of the six intruders shown in Linda’s photo) to return the following year and make an eviction attempt. We should expect, therefore, that parents would hide their chicks from intruders whenever possible. Of course, breeding pairs are fighting a losing battle. On the one hand, they must feed and protect their chicks, which includes vocalizing often to warn their mate and chicks of passing eagles and other dangers. On the other hand, when intruders fly over or land, parents need to ignore the chicks altogether. Toggling between these two behavioral modes is no small task. Furthermore, while it is desirable to protect your long-term ownership of the territory by hiding your chicks from intruders, you do not want to lose them in the process! Although chick-hiding is a tricky business, loon families do have a strategy for coping with the sudden appearance of intruders overhead, which fly over at a speed of about 70 miles per hour. We call it “dive and scatter”. At the appearance of a flying intruder in the distance, a loon pair and their chicks quickly slip under water. The chicks swim toward shore and, once there, are hidden by their brown plumage, which makes them resemble rocks or logs. Meanwhile parents swim under water to the middle of the lake, which draws the intruders to them and not the chicks. The aim of this coordinated behavior pattern by chicks and their parents seems clear: keep intruders from seeing the chicks. On its face, dive and scatter behavior clearly seems a means of helping parents’ maintain possession of their territory. I need to pause here for a second to consider an alternative explanation for dive and scatter. In fact, the most obvious reason why a pair and chicks would dive and scatter is to protect the chicks themselves. Intruders do kill chicks commonly, so this is a viable hypothesis at first blush. But chicks are most vulnerable to being killed by intruders in their first two weeks, so dive and scatter as chick defense — if it is a viable explanation — should occur mainly among small chicks. Yet dive and scatter occurs rarely in small chicks and very commonly in those four weeks and older. So the hypothesis that dive and scatter is a behavior to protect small chicks from intruder attacks can be easily rejected by its timing. We have known about dive and scatter behavior for some years, but yesterday on Woodcock Lake I learned that loon parents know when to call off the ruse. While feeding their single chick along the lake shore, the Woodcock pair spotted two intruders in flight. The family dove and scattered, the chick hiding near shore and parents making for the lake’s center, in stereotyped fashion. Following the script, the two intruders landed by the parents (and far from the chick), the four adults circling and diving together for several minutes. The charade abruptly fell apart when an eagle flew over the part of the lake where the chick was hiding. Both parents immediately ceased interacting with the intruders, wheeled towards the eagle, and wailed desperately for several minutes, while swimming in that direction. In a half-second, the breeding pair had morphed from cool, detached individuals with nothing to hide into into frantic worry-warts! Some might view such a loss of composure by a breeding pair to be quite costly. If intruders are able to learn about the presence of chicks by detecting chick defense behavior such as that shown by the Woodcock pair, then the pair exposed themselves to the threat of future eviction by wailing to defend their chick in the presence of two intruders. A clear blunder….until you consider that the alternative was to lose the priceless product of their summer’s breeding efforts. If you have been floundering lately, as I have, let’s gain some perspective by considering the plight of the Silver Lake loons. The pair’s struggles began in mid-May, as black flies thwarted their efforts at incubating a first clutch of eggs. According to Pat Schmidt, who watches the pair carefully throughout the breeding season, incubation proceeded normally during the nighttime — cool temperatures kept the relentless pests at bay. But the marked female and male were unable to stay on the eggs during daylight hours, when black flies were active and biting. On again, off again incubation finally gave way to abandonment during the last week of May, but the pair reset themselves quickly, adding two additional eggs to the two they had earlier tried and failed to hatch. Despite the cumbersome task of warming four large eggs simultaneously, the birds produced a chick at the very end of June. Their fortunes seemed to have turned. The greatest risk faced by a breeding loon pair with a chick is our national bird. Bald eagles nest on tall white pines along lake shores and are a frequent sight over lakes. Indeed, eagles are such a routine part of the scenery on the lakes that loons often deign to wail at them as they pass overhead. Eagle fanciers might try to convince us that these raptors even purposely lull loons into a false sense of security with their constant, mostly innocuous flights nearby so that they can occasionally strike at loons suddenly with deadly purpose. An opportunity for such a surprise attack might occur when an eagle appears just above the tall trees at the lake’s edge as a week-old chick’s parents both happen to be underwater diving for food. Perhaps it was such happenstance that allowed an eagle to carry off the Silver Lake chick on July 2nd. In any event, eagle predation brought the breeding efforts of the pair to an unsuccessful close this year. The sting felt by lake residents at the loss of the chick had begun to abate by July 18, at which point the territorial female, “Copper” (named for one of her plastic leg bands), found herself in a desperate battle. She was beaten badly, chased across the water, attacked from below as she rested on the lake surface, and finally forced to take refuge on land to escape further damage. By the time the violence had ceased, Copper had to be carried, helpless, to the Northwoods Wildlife Center. She died there a few days later. As I have made clear in numerous posts, males are the ones that battle dangerously (apparently because of senescence) in most cases. So how do we explain the latest Silver debacle? An oddity concerning contestants might offer a clue in this case. Copper, who had reared chicks on Silver in 2014 and 2015, had battled repeatedly for ownership over the past several years with her bitter rival, “Mint”, the previous Silver female and mother of the chicks in 2010 and 2012. Even after losing the territory to Copper in early 2013, Mint was a frequent intruder into Silver Lake. Hence, both females had raised chicks in multiple years with the male, and both were highly motivated to vie for control of the territory. In addition, banding records indicate that Copper and Mint were of very similar size. Now to game theory. If an animal encounters a long-lived opponent with which it is very closely matched in fighting ability but happens to get the upper hand at some point, it might then pay for that first animal to press its advantage and even kill the opponent. Why? Because our research has shown us that closely-matched pairs of females, like Copper and Mint, often give each other fits. Two females on Heiress and two others on Oscar-Jenny were so close in fighting ability that they traded off ownership of those territories over many years, each female hindered in her breeding efforts because of the constant interruptions of the other. The result was poor reproductive success for both rivals. Although there is enormous risk involved, it might occasionally pay for females to exhibit the vicious battling we associate with males. Specifically, a lightning strike to finish off your archrival might sometimes be worthwhile to avoid a chronic, destructive feud. “Wow”, Lainey said, “that band number is right next to the female we caught last night on Sherry”. 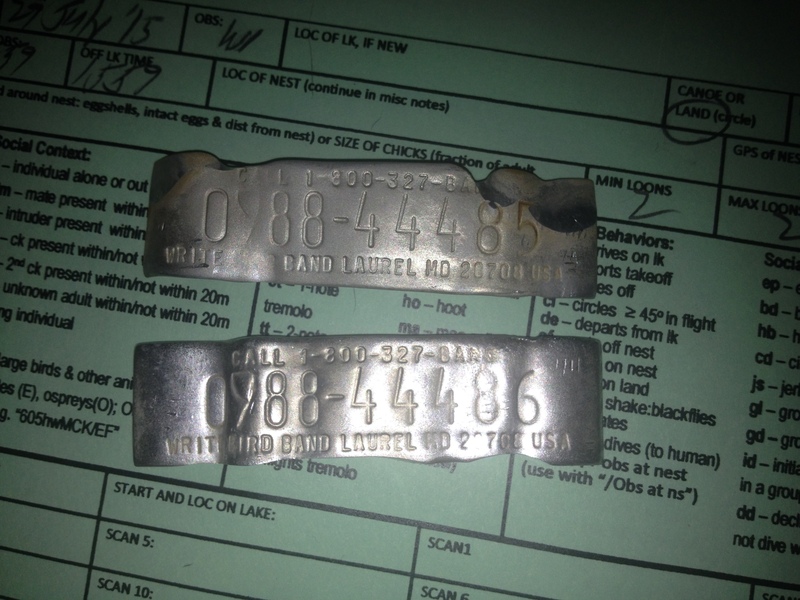 She was right; the adult male from Skunk, which we had just netted and whose band number I was reading aloud to Lainey for data entry during banding, had a number imprinted on his aluminum USGS band that followed immediately after that of the Sherry female from the previous night. The reason for consecutive bands is that the Sherry female is the mother of the Skunk male and was caught and banded with him a decade ago (less two days) on Sherry Lake. I remember July 31st, 2005 on Sherry vividly, because I was equipped with a video recorder on top of a helmet with which we recorded the capture process for research presentations. But the recapture of mother and son on back to back nights ten years after we had first marked them has also caused me to reflect upon several key features of loon biology that have become familiar to me through my work. First, loons live a long time. In this twenty-third year of my work, I still encounter birds in the study area that were on territory, as adults, when I first started covering them. Females, in particular, are survivors. While males have rather high mortality –partly owing to their proclivity for battling dangerously — females linger. When their mate dies, females find another; when a female is evicted unceremoniously from her territory, she stoically moves to a new lake nearby and awaits a chance to re-insert herself back into the breeding population. So it goes with the Sherry female whose worn-out band from 2005 is pictured on the bottom in the photo. She was “widowed” suddenly in 2009 (a possible eagle kill) but hung onto her territory and was joined by a new male in short order, who has been her mate since. Third, loons vary tremendously in their behavior towards humans. My assistants and I dread the Sherry female, because she is the most skittish individual we know. She cannot be approached easily within 100 meters on the water; she tremolos (i.e. alarm calls) incessantly when a chick is present and a canoe appears on the water. In fact, my assistants tell me that she begins to tremolo in anticipation of a canoe being placed on the water and that they have begun a strategy of hiding behind bushes and trees along the shoreline in order to make observations of her when she is with the chick. (Fortunately, Sherry Lake is tiny, so this observation strategy is workable.) I joked that we should wear camouflaged clothing when visiting Sherry; my assistants did not find this funny. Oddly, the Sherry female’s mate is among the tamest loons we study and never tremolos at us when we collect data there. The great variety in loon tameness is a topic of great interest to us, as I have mentioned. It amazes me that an adult such as the Sherry female could react so strongly (and, it would seem, maladaptively) to humans, which she encounters constantly. Doesn’t she waste energy with her fruitless calls? Shouldn’t skittish birds like her leave fewer offspring and live shorter lives than other adults who tolerate humans without constant complaint? If so, she is not a good example of the pattern, as she has behaved this way for the ten years we have known her while cranking out chicks. Indeed, the Sherry female and the Oneida-East male, another vociferous but fecund individual with whom my staff has to cope, make me wonder if I have got it backwards. Maybe loud-mouthed loons warn humans away, lessening the likelihood of injury to themselves and their brood, and are rewarded with high evolutionary fitness. This morning Kristin found the banded male on Tomahawk – Sunflower Bay freshly killed and being consumed by eagles. This is a sad discovery for us, because he was a sweet, tame bird with a rich history of rearing chicks — on two separate territories. We cannot be certain that an eagle killed the male, but he was healthy on our last visit, and the pair had recently nested. So we strongly suspect our national bird! This is a reminder that, while they usually seem to be merely a nuisance, eagles DO have the potential to kill adult loons. Our best-documented example of an adult kill was a female attacked and dispatched by an eagle on a nest on Alva Lake back in 2005. Of course, eagles are a constant threat to chicks. Funny, but I have struggled to love our national symbol recently. I hope that does not sound unpatriotic!